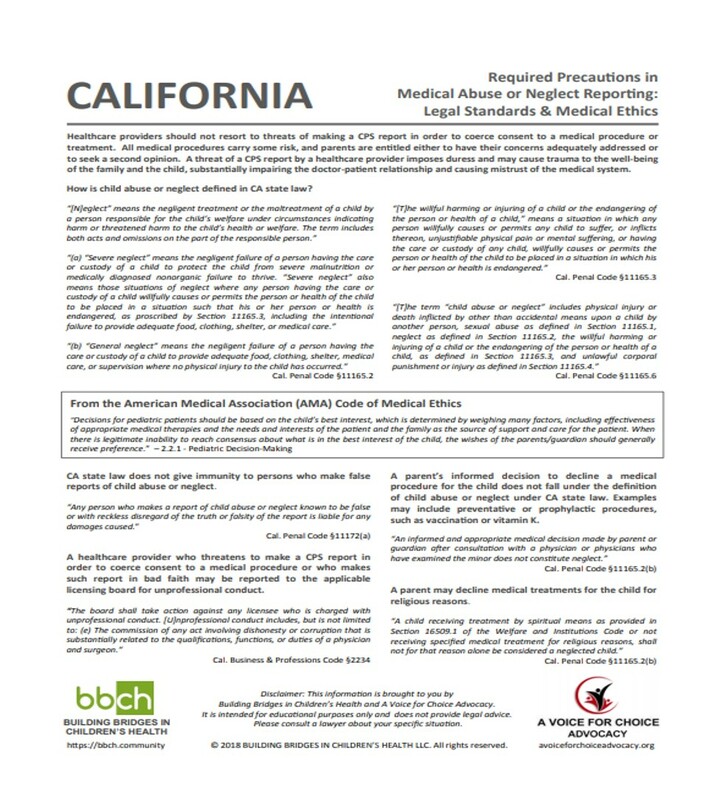 TAKE ACTION: In response to the California Medical Board’s investigation of Dr. Sears and other doctors, several articles have been written exploring the issue of MEDICAL NEGLIGENCE. The authors propose reporting negligent doctors by filing complaints with the YOUR State Medical Board. Criteria for filing might include: 1) refusal to write a legitimate medical exemption, 2) failure to report and chart adverse reactions, or 3) inappropriate dismissal from practice. Click your state below to file a medical negligence complaint to your state’s Medical Board. Be sure to send a copy of your REPORT to info@avoiceforchoiceadvocacy.org. Thank you! A Voice for Choice Advocacy joined forces with Building Bridges in Children’s Health (BBCH) to create an information sheet on the Required Precautions in Medical Abuse or Neglect Reporting: Legal Standards & Medical Ethics, to help parents and doctors navigate coercion of medical procedures or treatments.